This is a "work in progress". This may get pretty lengthy and involved, but if it gets too long for one wiki-page, I'll be subdividing it. placed on whatever it is you are advocating, such as liking, selling, recommending, and so forth. have an account with also are: Google+, Pinterest, LinkedIn, StumbleUpon, Tumblr, WordPress, and some others. 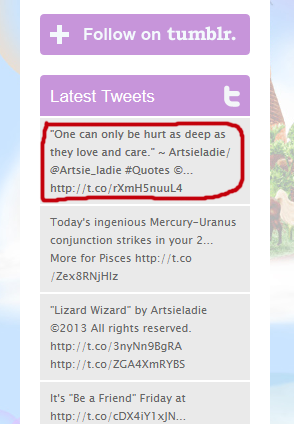 tweets on Twitter, will be displayed on any site where this capability is implemented. from one account to Twitter, no worries, because once it goes to Twitter, automatically it's displayed on all the "receiving and displaying"
sites you have connected to Twitter. sites that do not, are Google+ and Pinterest. These need a G+ and a PinIt button, respectively. - Connecting Facebook to Twitter: To enable, you have to use the Twitter application on Facebook. To find, enter "Twitter" in Facebook's search. "Facebook" and then connect to Facebook. status on Facebook, and have it set up so your Facebook statuses are sent to Twitter, then keep this in mind for when it is displayed on Twitter. Now simply compare in the image, my Facebook status (left) with how it will appear on Twitter (right) and you should be able to see how it works. join me on Elfpack! Membership is FREE!" This is because I edited it to say what I wanted it to say instead of what originally displayed. - Pinterest: Both your activity and what you like on Pinterest can be displayed on Facebook. - StumbleUpon: What you stumble can be displayed on Facebook. - Klout: Your activity "and its influence" is measured on Klout and much of what you do on Klout can then be noted on both Facebook and Twitter.